I’m slowly getting more and more excited to see this. Terry Brooks’ classic Elfstones of Shannara on television. The visuals alone are great, and I just hope the writing for the show is just as good. Cobra vs. Python-clashing in the streets of Singapore. It sounds like a natural for a Syfy movie. 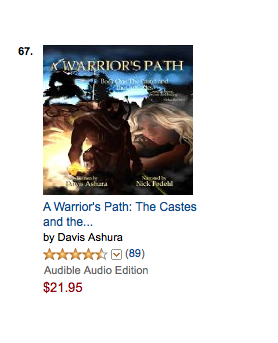 The audiobook version of A Warrior’s Path is in the top 100 for epic fantasy on Amazon audiobooks! Pretty cool stuff. I didn’t even know the list existed until fellow author, Tim Marquitz, pointed out his book on the same list and the screenshot showed mine sitting there as well. BTW here’s a screenshot of the momentous occasion (you gotta grab these things quick because in just an hour, my book might very well fall of the list). Here’s a sample of the audiobook of A Warrior’s Path. The audiobook for A Warrior’s Path is ready! The audiobook version of A Warrior’s Path is out today! The narrator, Nick Podehl, did a great job. It should be out on Amazon’s main site and iTunes early next week. ‘First lady’ of the Khmer Rouge dies. Funny how benign evil can appear. Davis: With me today is John D. Brown, or The Man as he’s known in some parts. Welcome to my little home on the web, John. We’ll start off with a little history if you don’t mind. In terms of your prior writing, I believe you started out with short stories and had an epiphany during a workshop led by Orson Scott Card. What happened? So in year five, Orson Scott Card had just started his boot camps. And I thought—maybe that will help. The first two days were about story idea development. And then on Wednesday we were supposed to write our story. I went to the library determined to write a story. So I sat down in the library, collecting zing about the Iroquois, trying to figure out my story. I worked and worked and worked, and twelve hours later, I had exactly nothing. Oh, I had lots of zing. But not even the beginning of a story idea. I had no idea what I was doing. That night I called my wife. I told her the bad news. I figured this was the writing on the wall. I had come to the conclusion I wasn’t cut out for writing. It was Thursday night. The boot camp had only two days left. I went to Golden Corral for dinner, got my plate of roasted chicken and mashed potatoes and fried okra. I sat there all morose, making a few lackluster attempts at a story, knowing it wasn’t going to revive. Knowing it meant that I didn’t have a storyteller’s DNA. And then I did something. And suddenly it was like someone had plugged the carnival in. The lights went on. The music started playing. The story rolled out in front of me like a red carpet. All that zing I’d collected on Wednesday was channeled into a structure. And suddenly a story was alive and bucking in my hands. I got up and ran to the front door. I wrote that night. Wrote every free moment on Friday. Wrote Friday night. Finished it early Saturday. It was the first draft of “Bright Waters” which went on to be published multiple times. But the key wasn’t that I’d gotten a great story idea. I’d done that before. It was that I’d finally started to see what it was that was holding me back. Davis: I’ll overlook the restaurant choice – as an endocrinologist, I can’t very well support an all-you-can eat buffet – but a lightbulb moment? Really. Nuts. For me it was just writing one sucky paragraph at a time and figuring out what I did wrong…one million crappy words later. So moving on. When did you make the transition to novels? And how long did it take you to figure out how to write well. And please don’t say right off the bat. John: I made a goal to write five novels in five years when I got home after the boot camp. I wrote some shorter works, then immediately got to work on the novel. Nine months later, I finished the first draft of my first novel. I knew it was flawed, and immediately began writing another. As for writing well, there was never any line I crossed when I thought, boy, now I’m writing well (grin). “Writing”, to me, is the ability to convey your ideas with clarity in written form. I’d been writing for a number of years in college in various classes before I won that Writers of the Future award. But writing stories isn’t about clarity. Nobody reads for clarity. They read for the content you’re presenting and, most importantly, the experience you guide them through. Every genre provides a slightly different type of experience. Every story does as well. And so I’m still learning things about telling stories. I think that’s why writing stories is such a great thing—there’s so very much to learn about developing and enjoying and sharing these types of experiences. Davis: Ah! I see. Then it was a ½ million words of crap before you got good. That’s my guess, and I’m sticking with it. Anyway, your first novel, which I purchased in hardback (you’re welcome) was titled Servant of a Dark God, and it was published by TOR. But then came radio silence and I find out you actually parted ways with TOR. All I can say is: what the…? And as a follow up, would you want to eventually have a sort of hybrid career with some of your work self-published and others traditional? John: Thank you for giving me a try, you intrepid soul. I learned a lot from the good people at Tor. But the bottom line is that my editors and I had a different vision for the story. Because of this, our rocket ship to the moon tilted and blasted off into the swamp. With differing views, there was no way to get it out. Not all business partnerships succeed, and there’s no use in persisting in one that isn’t going to work. Indie publishing had become a viable option by that time, and I figured that’s how I could get the ship flying again. So I talked to Tor, and we parted ways amicably. As for the hybrid career, I don’t care how I get my stories to readers. If an opportunity arises that makes business sense, I’ll take it, indie or traditional. But it must make business sense. Davis: Business is the toughest part of publishing and if people ignore it…well, that’s a choice I suppose. Now, after breaking with TOR and deciding to self-publish, has this been freeing in terms of allowing you to write the story that you wanted to write all along? And while freeing, I imagine it’s also terrifying. John: Yes, as an indie author I’m in full control. And I’m writing the things that drew me to the story in the first place. But being indie is not terrifying. It’s exciting. It’s also challenging and demanding. Sometimes daunting. There’s a lot of work involved and a huge amount to learn—formatting ebooks, formatting print books, copy editing, proof-reading, marketing, descriptions, cover design, websites, and that’s all in addition to the craft part. And because I’m bootstrapping, I have to do a lot of it myself. But I’m happy. When I was deciding whether to shop my thriller to New York, I asked my agent what kind of advance we should expect. Not pie in the sky. Just a reasonable one. She said probably $15k. If they really liked it, maybe a two or three book deal for $30k each. Last year my thriller made about $13k. That was the first year. Just me on my own. A publisher would have locked down the rights for years and years, but I did that on my own in one year. But, geez, it’s a lot of work. I look forward to the day when I can focus exclusively on the story telling again. Davis: You ain’t lying about the work. I dream of having enough money to pass the drudgery of publishing on to someone else. Now, we’re on to your fantasy series, which is now re-titled Dark God and book 1 is Dark God: Servant. Tell us a little about the story. John: There’s a girl, a blacksmith’s daughter, accused of using sleth magic, a very dark art. She’s on the run. There’s a farm boy who thinks he has an opportunity to bring her in. But what neither of them know is that there are bigger things afoot. A being of irresistible powers, the old master of the land, has returned. And she is gathering her servants to usher in a human harvest. And these two find themselves right in the middle of it. It’s been a very satisfying story to write. Lots of action, secrets, magic, a new world, and characters and dilemmas I love. Davis: In your first book, you have a typical fantasy trope of a boy from the back end of nowhere named Talen and a feisty young girl named Sugar. You then subvert them by not doing what I expected. In addition, while they are the main characters, the character who stole the story for me was Hunger, the creature of grass, wood, and stone. If you can discuss him without spoiling the book, what was his purpose in the novel? John: I love Hunger. He made me weep. He fascinated me. He made me cheer. He horrified me as well. He was a joy to write. His purpose, well, that sounds like I created him to serve some function. I guess at one level he’s the main villain’s henchman. So you might say that’s his function. But I didn’t write him to be some cog. I wrote him because his character and his problems fascinated me. And I wanted to share that with the reader. That’s how I look at writing. I’m going out into the wilds, finding and developing these awesome things, and then bringing them back to share with others. And in this book, there were four main people, four main stories that I was drawn to—those of Talen, Sugar, Hunger, and Argoth. Some say this novel is Talen’s, and he does have a lot of stage time. But it’s not his book. It’s about all four of them. And in the beginning, two of them are antagonists, two protagonists, and all of them impact each other. But the antagonists aren’t villains. Oh, Hunger’s brutal, but a lot of readers find themselves rooting for him. And that’s part of what appealed to me about these characters. Davis: In the first book, Servant, I won’t discuss this too much because it will be a bit spoilerish, but the magic of your world and the underlying truths are very powerful and challenging. What was especially powerful is the name of those with the greatest power: Mother. I hate to ask “Where did you come up with it” but I’m going to ask: Where did you come up with the Glories? John: The reason for all of that is revealed in later books. This is one of the things Talen, Sugar, and the others will uncover. So I guess I’m going to have to keep you waiting on that one (grin). Davis: Gagh! That’s not an answer! Sigh. On to book 2, Dark God: Curse. For me, this was really about two characters, Argoth and Shim. Then comes book 3, Dark God: Raveler where the focus returns to Talen and Sugar. I greatly enjoyed all three books, but the pacing is different in all three. While Servant had a slow build, in books 2 and 3, there is no build up. The action starts and never lets up. And a new menace and mystery arises. That new menace really adds a richness to this world, so I have to ask: just how long have you been working on this story? John: Well, since 2007 when it got me my agent. I sold it to Tor in 2008. Had the first published in 2009. I’m glad you enjoyed that new menace and mystery. I love them. They were part of the original design, although it wasn’t until book two that I fully discovered the role they’d play. As for the pacing, I don’t know if you’ve read Servant, the new version, but I think that changing the beginning back to my original sequence allows it to start more quickly and with a bang, which is how I first designed it. But even so, you’re right that books two and three move faster. Part of that stems from the fact that there are three story lines in those books instead of four. Another part is probably my evolving style. And while it sounds like you enjoyed Argoth’s parts in Curse, there’s a lot of stage time given to Talen and Sugar. There are many things going on with those two in that book that I really enjoyed. However, you’re right that I’m not trying to parse out stage time to the various main characters in exact proportions. Brandon Sanderson felt he needed to do that with Elantris, rotating chapters in a strict sequence between characters. But not every story needs that. What I want to do is tell the stories that pull me. And with these three main threads, I suspect sometimes one will need a bit more time than the others. Davis: And going forward, where is the story heading and when can I…er…we get it? John: The story is heading, hopefully, to a place you won’t expect (grin). I’m in the publication phase for Awful Intent, book two in my thriller series. Once that’s out, I can turn to the next project. I have an outline for Glory, book four in the series. And I’m going to have to spend some time determining if I write that or the next thriller. I will write it; it’s just a matter of timing. Davis: (please let it be Glory. please let it be Glory) And finally, a sort of review. In a lot of fantasy novels (or pop culture for that matter), I don’t see fathers in fatherly roles. They’re warriors, kings, merchants, whatever. But they aren’t fathers first and profession second. I thought you did a great job in showing men as good, decent fathers, so this isn’t a question but simply an observation and a congratulations. And as far as the action I mentioned is concerned, I don’t like roller-coaster novels where you’re just going up and down and going nowhere. I hate that, which is why I loved the action in your books. Revelations are made, loss occurs, and danger is everywhere. There’s a purpose to the action, and it isn’t to demonstrate how awesome Talen, Sugar, Argoth, or Shim happen to be, but something more fundamental: it’s about people first. In addition, there’s a patience to the pacing and the plot, which sounds weird when I talk about how electric it is, but it’s also true. A common mistake I see in many authors is powering up their characters too quickly. I don’t know if it’s the impatience of youth or the influence of ‘leveling up’ from video games. So, do you have any words of wisdom for those who aspire to write as a career? How to become better writers beyond the obvious of reading? John: I’m glad to hear you enjoyed the fathers. And the stories. At their heart, these stories are about families. Brothers, sisters, moms, dads, uncles. That’s one of the things that drew me to these situations in the first place. My advice to new writers is that they need to learn three things to be successful. One, learn what it is stories do to the reader, the reason why we love stories in the first place, and how those stories deliver that. It’s hard to hit something if you don’t know what you’re aiming at. Two, sensitize yourself so you can notice those feelings. This allows you not only begin to notice what makes things work, it also gives you more control over your craft. Three, learn the principles of developing ideas. Knowing how stories work is totally different from knowing how to develop one. Remember the story I told about Card’s boot camp? A big part of my problem was not knowing the principles of development. I’ve got pages and pages about all three of those things in the On Writing section of my website. Davis: I’ver read many of those pages, btw, and they were very helpful. So thank you for that, the wonderful books, and for your time, John. It’s been a pleasure. Any last words you want to say? John: I totally enjoyed it. Thanks for having me on.